Libya's former justice minister has told a Swedish newspaper that Colonel Gaddafi personally ordered the Lockerbie bombing. Mustafa Abdel-Jalil told Expressen he had proof the Libyan leader was behind the bombing of Pan AM flight 103, which killed 270 people in 1988. Following the disclosure the Crown Office said it would "pursue such lines of inquiry that become available". Abdelbaset al-Megrahi was jailed in 2001 for the attack. However, the Libyan was released on compassionate grounds in August 2009 by the Scottish government after being diagnosed with prostate cancer. Dumfries and Galloway Police are reportedly monitoring events in Libya in the hope of new leads in the case. Expressen quoted Mustafa Abdel-Jalil as telling their correspondent in Libya: "I have proof that Gaddafi gave the order about Lockerbie". However, he did not describe the evidence. Abdel-Jalil stepped down as justice minister in protest of the violence used during against anti-government demonstrations. He told Expressen that Gaddafi gave the order to bomb the plane to Abdelbaset al-Megrahi, the only man convicted of the attack. 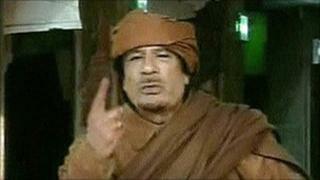 He said: "To hide it, he [Gaddafi] did everything in his power to get al-Megrahi back from Scotland." Expressen spokeswoman Alexandra Forslund said its reporter, Kassem Hamade, interviewed the ex-justice minister at "a local parliament in a large city in Libya". However, the spokeswoman said she did not want to name the city because of security concerns. Expressen taped the interview, which was conducted in Arabic and translated into Swedish, Ms Forslund said. Colonel Gaddafi accepted Libya's responsibility for the Lockerbie bombing and paid compensation to the victims' families in 2003. However, he has never admitted personally giving the order for the attack. Scottish Conservative Deputy Leader, Murdo Fraser MSP said, given recent events, many would find the claim "disturbing but believable". He added: "If true, it makes all the more questionable the role of the last Labour government's drive to do all it could to send al-Megrahi back to Tripoli."